“We have not neglected you. 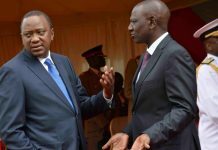 We have given you a Cabinet Minister and Chief Justice” – President Uhuru to the Abagusii. It is election time and tensions, more so fear of the unknown in the two camps of those seeking to retain power and the ones strategizing to wrestle it from the incumbents’ jaws, are understandably at fever pitch. It is especially so for those in power, as they never fathomed the possibility of the fragmented, disillusioned Opposition figureheads reuniting into a formidable coalition, presenting a real challenge to the status quo. It is also understandable that pressure is, naturally, always more on those in power to retain it in a contest, than it is on those wanting to ascend to it. What is not, and can never be understandable, however, is when the Head of State drags independent and constitutional offices into his game plan to retain power. It was unforgivable for the President to invoke the appointment of Justice David Maraga to the Office of the Chief Justice (CJ), as his regime’s reward to the community, to woo support of the Gusii community. It is eternally embarrassing to the CJ whose formative days in office should be expended on winning the confidence of the public – and more so the stakeholders in the dispensation of justice – on his abilities to steer the institution of Judiciary to greater heights and, like his predecessor, Dr Willy Mutunga, jealously guard its independence, especially after what was presented as a competitive process of recruitment that saw many other qualified candidates fall by the side. Above all, it is an abomination when the insinuations are made in an election campaign whose results will, as sure as the sun sets, be contested in the Supreme Court in which Justice Maraga presides. It is for the foregoing that the New Constitution of Kenya 2010, in express design to break with the past where appointment of the CJ, judges and all other senior judicial staff, including the Judiciary Chief Registrar, was left to the discretion, whims even, of the President, set strict procedures of recruitment that rested the powers to an independently constituted Judicial Service Commission (JSC) with the President’s role restricted to appointment – purely ceremonial. The office of the Chief Justice is an institution in itself. The Chief Justice is the Head of the Judiciary assisted by the Deputy Chief Justice. He is the President of the Supreme Court and links the Judiciary to other arms of Government. He assigns duties to the Deputy Chief Justice, the President of the Court of Appeal, the Principal Judge of the High Court, and the Chief Registrar of the Judiciary. He gives an annual report to the nation on the state of the Judiciary and the administration of justice, and causes the report to be published in the Gazette, and a copy thereof sent, under the hand of the Chief Justice, to each of the two Clerks of the two Houses of Parliament, for it to be placed before the respective Houses for debate and adoption. Above all, he exercises general direction and control over the Judiciary. For the Head of State to insinuate, whether by design or default, that he rewarded that office to a community for political expediency, is the highest one can go to undermine the entire institution of Judiciary. But equally smeared, if not more, in the President’s gaffe is the JSC. According to the Constitution, Chapter 10, 172(1), the Judicial Service Commission shall, among others, promote and facilitate the independence and accountability of the Judiciary and the efficient, effective and transparent administration of justice and shall recommend to the President persons for appointment as judges; review and make recommendations on the conditions of service of judges and judicial officers, other than their remuneration; and the staff of the Judiciary. In the performance of its functions, the Constitution says in 172 (2), that the Commission shall be guided by competitiveness and transparent processes of appointment of judicial officers and other staff of the judiciary, and the promotion of gender equality. Those, by any standards, are not mean responsibilities. They place the JSC right at the centre of things in the Judiciary. In fact, one could argue, a successful Judiciary is dependent on the competence or lack thereof, of the JSC. Indeed, the JSC put up a grand show in the process of the recruitment of the Chief Justice, televising live all interviews of those who appeared before them. For the lovers of the drama in the corridors of justice, it had us glued to our TV screens. 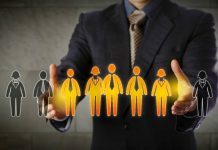 The questions and the witty, even rude, answers by some of the interviews offered a lesson or two to the young and not so young on the etiquette of job interviews. 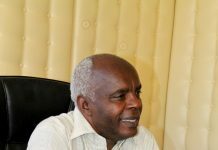 But it also offered the public an opportunity to put in a word or two, albeit in social media, on who they thought best suited the job flowing from the interviews, in what, just a few years back during the Nyayo era, seemed an unattainable. And when the Commission finally announced its choice, opinion was indeed very divided in the public domain. As it would be expected, in a civilised society, the public had its say, but the JSC, the body constitutionally mandated to carry out this function, had its way. Eventually, insisting they arrived at the best in a fair and just process, it forwarded the name of Justice Maraga to the President for appointment. So, why did it take the JSC an eternity to respond and refute and condemn the President’s utterances in a political rally to the effect that his regime had awarded a community with the appointment? Was it a question of complacency, passiveness, ineffectiveness or incompetence? It took the JSC – and the Chief Justice – three weeks to, separately and, in what seemed as a hurried, choreographed response, to reply to the Presidents utterances. The President’s remarks on the appointment of CJ David Maraga were “unfortunate”, read in part the JSC’s statement signed off by the Chief Registrar, Anne Amadi. “This could have been misconstrued to imply a political hand in the appointment of the Chief Justice… There is neither room nor opportunity for the President to discharge this function in a political manner… Any implication, deliberate or inadvertent, that the appointment of the CJ was part of a political scheme is a grave distortion of law and fact…The Judiciary, in exercise of its authority, is only subject to the Constitution and the law, and not to any person or authority”, JSC admonished. By any measurement, it was a smart and well-deserved response, but three weeks too late. 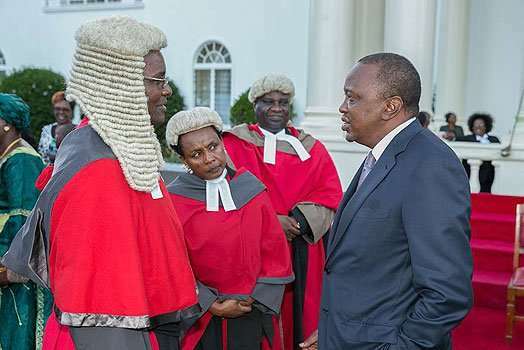 The President’s words had sparked of a national debate on whether indeed Justice Maraga’s appointment was purely on merit as the JSC had belaboured to portray to the nation shortly after the announcement of his name. This response to the President needed to have come minutes, hours at worst, late, after the rally in which the utterances were made. In a separate statement by the CJ himself, dispatched on April 10, exactly three weeks after Uhuru’s rally in Gusiiland, Justice Maraga said, “I am only too aware of how critical the Judiciary is in securing Kenya’s stability, and would be the last person to do anything that would undermine public confidence in the institution. I would urge other players in the political and media scene to help me in this regard, and refrain from making statements or reports that wrongly project me and the Judiciary as partisan. A smart but impotent response, because of the time lapse. If that had come hours or even a day after the President’s infamous words, the effect would have been tremendous. The two separate responses by the JSC and the CJ, however intelligent and eloquent, only achieved the opposite of the intention for which they were purposed. They rekindled the debate the President had stirred up. Now that they had hesitated and did not take the opportunity to strike the iron whilst still hot, wisdom would have dictated to the JSC and CJ let sleeping dogs be. Indeed, Kenyans had taken it that the CJ, and the JSC had chosen to ignore and treat the political talk as not being worth their attention. That belated response raises serious questions in the minds of members of the public, putting to question the ability of the JSC to be suave and smart in dealing with arising issues in their day-to-day running of the Judiciary. The August 8 General Election is just around the corner, and the presidential election is most likely to end up in the Supreme Court. Such gaffes by the JSC and the Chief Justice do not inspire confidence in the Court’s capacity to handle such a petition objectively.